As the New York Aquarium gets a new look, let's look back at the old Aquarium. It was originally contained within Castle Clinton at Battery Park, where it opened in 1896 and was closed by Robert Moses in 1941. Described in 1900 as "the only place of amusement to that part of the city's population that lives below Canal Street," the Aquarium was built around a big circle with the walls lined with over 100 tanks, and 6 large pools placed around the largest in the center. 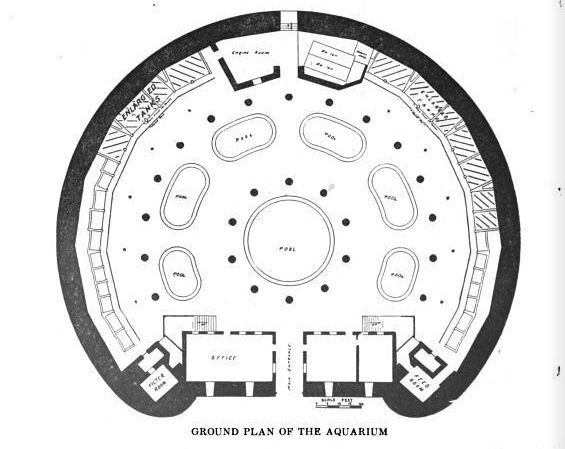 The rendering below shows aquatic mammals in the pools and the Guide to the New York Aquarium of 1919 confirms that dolphins, porpoises, and manatees were sometimes kept in these confining tanks, though it appears they did not last long there. Sea lions fared better and were kept regularly and for many years here. The Aquarium also had alligators and crocodiles, beavers, frogs, and the usual assortment of fishes. Proud of its acquisitiveness, like many zoos and natural history museums of the day, the Aquarium issued a special "poster stamp" advertisement in 1914 celebrating the capture of a porpoise, an image based on a photograph taken during the Zoological Society's hunting expedition at Cape Hatteras. But the joyful brutality of its hunting expeditions did not mar the tranquility of the Aquarium. 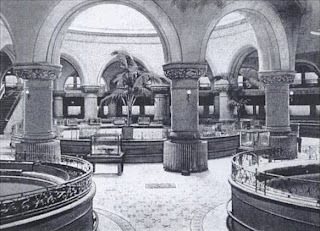 It was an elegant place, a wavering grotto decorated with palm trees, arched columns, and wrought-iron scrollwork designed by McKim, Mead, and White. Its closure in 1941 was controversial. The city loved its Aquarium, but Moses wanted a bridge at Battery Park. Denied that, he then wanted a tunnel. He would tear down Castle Clinton (he failed) and so the Aquarium had to go. 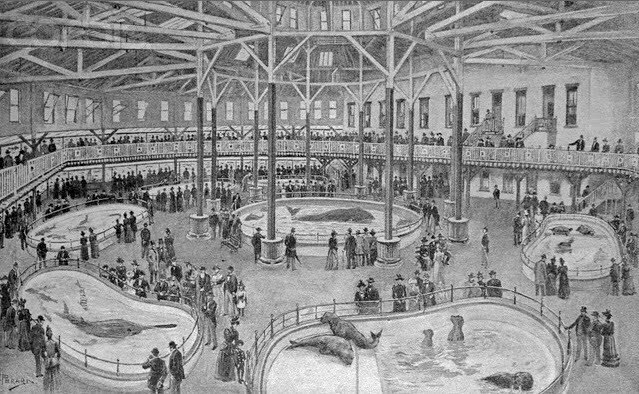 The animals and fishes were moved out, scattered to Boston, Philadelphia, Baltimore, and Washington. The sea lions were placed temporarily in the lions' house at the Bronx Zoo. TIME Magazine recalled the closure: "The last visitors shuffled out into the brilliant sunshine of Manhattan's Battery Park. Inside the Aquarium, the big pool where the sea lions once arched their sleek backs was empty; in the green gloom of the cavernous, dank galleries, water gurgled away, the lights went dark. The world's biggest marine exhibit, its denizens shipped away, was being dismantled." 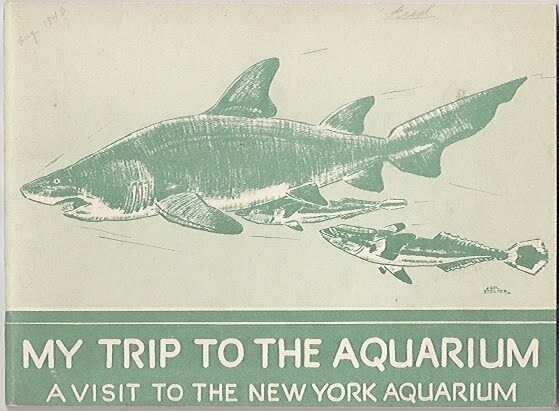 The old Aquarium was beautiful and it was also free, unlike the new Aquarium at Coney Island, which did not open until 1955, 14 years after Moses destroyed the old one. Power Broker author Robert Caro called the new Aquarium, with its high entrance fee, Moses' revenge on the city for not letting him have his bridge at Battery Park. 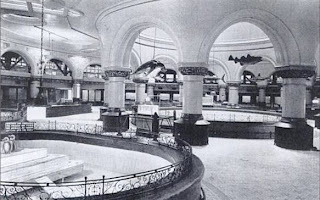 Caro recalled the wonderful ambiance of the old Aquarium: "a pungent and warm blend of age and familiarity and long affection and human scale, of busts of old singers and the flash of bright fish, of gloomy corners where one could neck with one's date, of being easy to get to and free, so that people could simply walk in as if it belonged to them. One might admire the new Aquarium; one could never love it." Moses would have disagreed with such sentiment. As he said in 1941 in response to the pro-Aquarium protesters: "There is no resemblance between the removal of the Aquarium and the scuttling of Old Ironsides... In the new plan for Battery Park the Aquarium is an ugly wart on the main axis leading straight to the Statue of Liberty... There is...more honest-to-God romance any early morning in the Fulton Fish Market...than in the Aquarium in a month of Sundays." 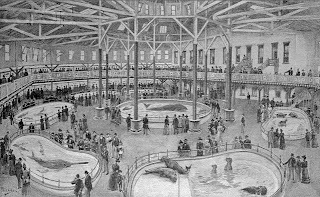 Of course, the romance of the Fulton Fish Market (which was the main supplier of food to the animals of the Aquarium) has also since been scuttled in the name of urban renewal and progress. 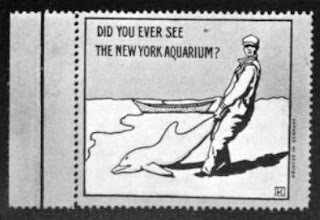 And, as the Wall St. Journal just reminded us, "The aquarium is a part of the Bloomberg administration's push to rejuvenate Coney Island and develop it into a year-round destination." 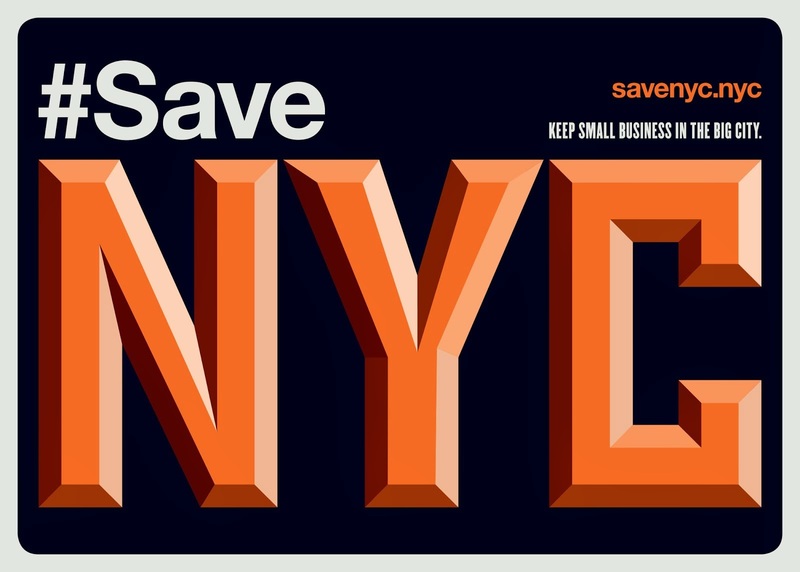 In other words, part of his plan to kill whatever's left of Coney Island. Again, he gets help from the Moses legacy. What a gorgeous place it was! Just looking at the pictures makes me so sad. I wish I'd been able to see it. I was just watching an old film on You Tube, The Penguin Pool Murder  and it looks like they actually filmed in this building.It was really quite extrordinary.Too many masterpieces lost to progress. So much for so-called "progress". Robert Moses' vengeance for not getting his big Brooklyn-Battery bridge over Battery Park.